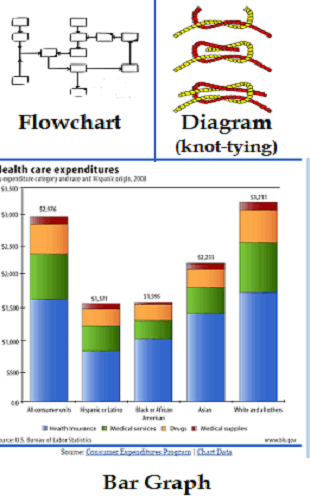 Charts and graphs are often used to summarize data. They make it easy to see trends and the amount of variation in the information being studied. That’s why it’s important to understand the ways charts and graphs display information. If you want to take the IELTS academic writing exam, you also need to be able to discuss them: to summarize the main features of one or more charts, and to make comparisons when appropriate. The graphs on this page are taken from two U.S. government websites: the CDC and the BLS. (U.S. government data is in the public domain, which means it is not under copyright and may be used and shared freely.) At the bottom of the page are links to more kinds of charts you can study. There were 34 pages teaching or practicing reading and other skills (writing & listening), 29 for grammar (also about half explanations and half practice pages), and 27 for tests and games, combined. Lesson plans, worksheets, and other help for teachers included 22 pages, and there were 12 other site pages. This pie chart shows the proportion of pages on EnglishHints.com on various subjects. Almost 50% of its pages are related to vocabulary, and more than half of those are vocabulary practice. The site has approximately equal numbers of pages for skills (instruction and practice in reading, writing, and listening), grammar, and tests plus games—around 1/8 each. Pages for teachers make up a just under 10% of site content, and a variety of other pages make up the last 5%. EnglishHints appears to devote about half its content to explanations and examples and the other half to practice activities including tests and games. x axis- horizontal; y- vertical. Remember to study the title and labels of the x and y axes carefully to be sure you understand what the graph is showing and the size of its effects. This chart illustrates the gradual increase in mentions of antidepressant drugs during visits to outpatient departments between 1993 and 2000. The y axis shows the number of outpatient visits and the x axis shows the period of time (in this case years) of the study. The colored lines represent different age groups. For most age groups there is a slight upward trend between 1993 and 2000 in the number of visits in which antidepressant drugs were mentioned. Between 1995 and 1998 there was a steeper increase in drug mentions for people over age 65. However, the overall number of mentions was highest at all times for the age group from 45-64 years old. There were slightly fewer mentions for the over 65 group, and still fewer for people aged 18-44. People under 18 had far fewer mentions. To summarize (or summarise-- the British spelling) means to give a short account of the most important points or features of a document or speech. Do not just repeat the exact words of the chart or instructions. Express the main ideas in your own words. If the change is slow or small, it is slight, minor, insignificant (unimportant) or a slow increase or decrease. If it is a large or fast change, you can also describe it as sharp, major, steep, or significant (important) or a rapid increase or decrease. Sometimes there is very little change: the situation is stable. Other times there is no single trend up or down, but fluctuations: a line that goes up and down, then up again, like waves. Useful words for ending your comments with an even shorter summary: in conclusion, to sum up, in general. How would you describe or explain the graph on the left? Try it (now, in your head or on a piece of paper), then compare your answer with my version under the chart. 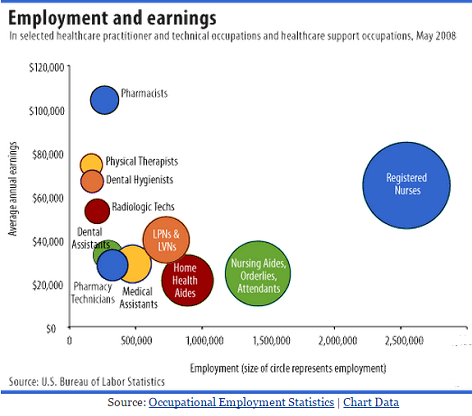 This chart compares employment and earning opportunities for various health care occupations in the U.S. The x-axis represents the number of jobs available (shown by larger and larger employment circles for occupations as jobs increase from 0 toward three million on the far right of the chart.) The y-axis shows average annual pay. As the average salary of occupations increases, their circles are found higher and higher on the chart. Pharmacy Technicians and Dental Assistants have few job opportunities (around 250,000) and low salaries (around $30,000/year), although Dental Assistants may earn slightly more. Medical Assistants earn about the same, but have nearly twice the job prospects—almost 500,000 jobs available. LVNs and LPNs have approximately 750,000 job openings as well as better pay-- about $40,000/year. Pay then increases for Radiologic Techs (nearly $55,000), Dental Hygienists (approximately $65,000), and Physical Therapists ($75,000+), although all three have small numbers of positions available—200,000 or fewer. Registered Nurses’ salaries are similar to Dental Hygienists, but they have over 2,500,000 job opportunities, far more than any other health occupation shown. Pharmacists’ wages are by far the highest of the groups included, although available jobs are limited to around 250,000. Don’t worry if the way you described this data was different from my description (or if your numbers were slightly different). However, you should have mentioned each of the occupations and compared them in terms of both earning potential and jobs available. For the IELTS writing task one, the summary must be at least 150 words and accurately fulfill the task requirements in the instructions. It should be well-organized, coherent (connecting your ideas in a logical order), and cohesive (using conjunctions and pronouns that clearly show the connections between the different things shown on the chart.) Use a variety of words and sentence structures. See this page from the I.R.S. for examples of two pie charts showing U.S. government income and spending (outlay) in 2012, as well as some questions to help you understand the charts. The picture at the top of this page shows an example of a bar graph, a line graph (the first graph discussed on this page), a pie chart, and a table. The chart on the right shows another bar graph, a diagram (sketch or picture), and a flow chart (showing the steps in a process. Each box that connects to more than one other represents a decision between two or more possible steps.) There are also organizational charts that show lines of authority and communication: who’s in charge, who reports to each supervisor, etc. The U.S. Center for Disease Control (CDC) offers an online course on Creating Easier to Understand Lists, Charts, and Graphs. They discuss how to read charts and graphs as part of the course. 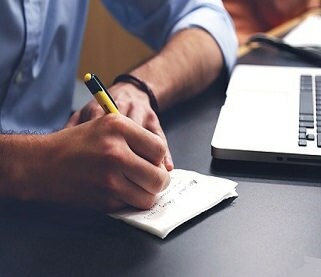 Helpful ESL writing tips, an explanation of the differences between speaking and writing in English, and links to essay examples, writing for exams, and more on academic writing.